Oral cancer is a common cancer and a major health problem in the Indian subcontinent. At our laboratory Mcl-1, an anti-apoptotic member of the Bcl-2 family has been demonstrated to be overexpressed in oral cancers and to predict outcome in oral cancer patients treated with definitive radiotherapy. To study the role of Mcl-1 isoforms in radiation response of oral squamous carcinoma cells (OSCC), we investigated in the present study, the association of Mcl-1 isoform expression with radiosensitivity of OSCC, using siRNA strategy. The time course expression of Mcl-1 splice variants (Mcl-1L, Mcl-1S & Mcl-1ES) was studied by RT-PCR, western blotting & immunofluorescence, post-irradiation in oral cell lines [immortalized FBM (radiosensitive) and tongue cancer AW8507 & AW13516 (radioresistant)]of relatively differing radiosensitivities. The effect of Mcl-1L knockdown alone or in combination with ionizing radiation (IR) on cell proliferation, apoptosis & clonogenic survival, was investigated in AW8507 & AW13516 cells. Further the expression of Mcl-1L protein was assessed in radioresistant sublines generated by fractionated ionizing radiation (FIR). Three to six fold higher expression of anti-apoptotic Mcl-1L versus pro-apoptotic Mcl-1S was observed at mRNA & protein levels in all cell lines, post-irradiation. Sustained high levels of Mcl-1L, downregulation of pro-apoptotic Bax & Bak and a significant (P < 0.05) reduction in apoptosis was observed in the more radioresistant AW8507, AW13516 versus FBM cells, post-IR. The ratios of anti to pro-apoptotic proteins were high in AW8507 as compared to FBM. Treatment with Mcl-1L siRNA alone or in combination with IR significantly (P < 0.01) increased apoptosis viz. 17.3% (IR), 25.3% (siRNA) and 46.3% (IR plus siRNA) and upregulated pro-apoptotic Bax levels in AW8507 cells. 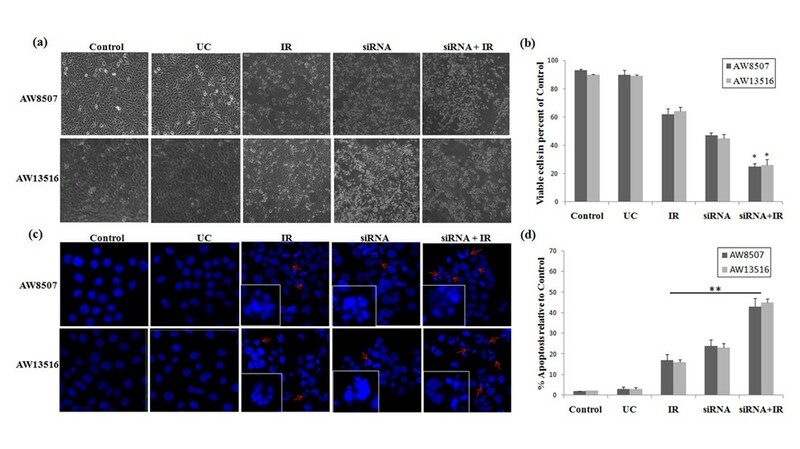 Combination of siRNA & IR treatment significantly (P < 0.05) reduced cell proliferation and clonogenic survival of radioresistant AW8507 & AW13516 cells, suggesting a synergistic effect of the Mcl-1L siRNA with IR on radiosensitivity. Interestingly, during the development of radioresistant sublines using FIR, high expression of Mcl-1L was observed. Our studies suggest that Mcl-1L isoform has an important role in the survival and radioresistance of OSCC and may be a promising therapeutic target in oral cancers. Squamous cell carcinoma of the oral cavity (OSCC) is the most prevalent cancer in males of the Indian subcontinent and is predominantly associated with the tobacco-chewing habit . Radiotherapy is an important treatment modality in oral cancer aiding in tumor size reduction and preservation of oral function . Despite advances in radiotherapy techniques, OSCC patients frequently develop loco-regional recurrence resulting in 5-year survival rates that have remained unchanged for past few decades . Hence for successful radiotherapy, it is crucial to understand the mechanisms involved in the development of radiation resistance in tumor cells. Anti-apoptotic members of the Bcl-2 family are the key regulators of cellular apoptosis and their over expression has been shown to be associated with radio-resistance [4, 5]. Mcl-1 (Myeloid cell leukemia-1), an anti-apoptotic member of the Bcl-2 gene family, is essential for development, differentiation, and proliferation . The overexpression of Mcl-1 has also been reported in a variety of hematopoietic, lymphoid and solid tumors [7–9]. Our earlier studies demonstrate the overexpression of anti-apoptotic Mcl-1 transcripts & protein in oral tumors and cell lines . Further, we have also demonstrated Mcl-1 to be a prognostic factor in oral cancer patients treated with definitive radiotherapy . Earlier, Mcl-1 has been shown to contribute in resistance of cancer cells to chemotherapeutic agents, however reports on its role in radiation induced apoptosis and radioresistance are rare [12, 13]. Further, the situation is complex due to the existence of distinct Mcl-1 isoforms having contrasting functions (anti-apoptotic Mcl-1L, pro-apoptotic Mcl-1S & Mcl-1ES). Earlier studies from our lab have demonstrated a five to ten fold higher expression of anti-apoptotic Mcl-1L transcript, versus the pro-apoptotic Mcl-1S in oral tumors . Therefore, in the present study we wanted to investigate the association of Mcl-1 isoforms with radioresistance of oral cancer cells using siRNA strategy. To the best of our knowledge, no reports are available on the role of Mcl-1 splice variants in radiation response of OSCC. The present study was undertaken to compare the time course profile of Mcl-1 splice variants and other Bcl-2 family members, post-radiation (IR) treatment in oral cell lines of differing radiosensitivities. Further, the effect of Mcl-1L knockdown alone or in combination with IR on cell proliferation, apoptosis and radiosensitivity of oral cells was investigated. Established AW8507 & AW13516 [10, 15] & FBM (fetal buccal mucosa derived immortalized cell line)  were selected for the study due to their differing radiosensitivities. The cell lines were cultured in IMDM supplemented with 10% FBS (Gibco, US), 100 units/ml penicillin, 100 μg/ml streptomycin, 2mM L-glutamine and keratinocyte growth supplements only for FBM (Sigma, USA), in 5% CO2 at 37°C. Exponentially growing oral cells were harvested, counted and replated in duplicates. After 24 hrs, the cells were treated with different doses of IR (1, 2, 4, 6, 8, 10 Gy) using 60Co-γ radiator along with an untreated control. Cells were then incubated up to 14 days to form colonies which were fixed and stained with a mixture of glutaraldehyde (6.0% v/v) and crystal violet (0.5% w/v) and colonies (≥50 cells) were counted using a microscope. The percent plating efficiency and fraction surviving a given radiation dose were calculated based on the survival of non-irradiated cells as described earlier . After 48 hrs of plating exponentially growing cells (6 × 103 cells) were treated with IR (D0 dose) using 60Co-γ radiator as described earlier . Cells were incubated upto different time points, harvested and stored in -80°C until use. Cell pellets were placed in TRI reagent (Sigma, USA) and total cellular RNA was isolated according to the manufacturer’s protocol. The RNA was dissolved in DEPC-treated water and contaminating DNA was removed by DNaseI treatment (Sigma, USA). RNA integrity was analyzed by electrophoresis and samples were preserved at −80°C until analysis, as described earlier . cDNA was synthesized with 2 μg total RNA, using a First Strand cDNA synthesis kit (MBI Fermentas, Canada) according to the manufacturer’s instructions. The efficiency of cDNA synthesis and equal loading were assessed by ß-actin PCR. Mcl-1 isoforms (Mcl-1L, Mcl-1S & Mcl-1ES isoforms) were amplified by using primers (forward 5’ACGCGGTAATCGGACTCAACCT3’ and reverse 5’GCAGCACATTCCTGATGCCACCT3’), as reported earlier . A separate PCR was performed to determine expression of Mcl-1ES isoform using forward (5’ACGCGGTAATCGGACTCAACCT3’) and reverse (5’GCAGCACATTCCTGATGCCACCT3’) primers as shown in Additional file 1. PCR products were resolved on 2% agarose gel containing ethidium bromide and quantitated using Gel-doc system (UVP, UK). Cell lysates were resolved on 12% SDS-PAGE gels and transferred onto PVDF membranes (Millipore, USA). Membranes were blocked with 5% skimmed milk in TBS for 2 hrs. Primary antibodies used were anti-Bax (1:150, Abcam, USA), anti-Mcl-1 (1:1000), anti-Bclxl (1:1000) and anti-ß-actin (1:2000) (Santa Cruz Biotechnology, USA). Secondary antibodies used were Horseradish peroxidase conjugated IgG (1:5000) (Santa Cruz Biotechnology, USA). Proteins were visualized with enhanced chemiluminescence kit (GE Healthcare, US). Densitometry analysis of developed X-ray film was performed using ImageJ software (NIH, Bethesda, MD). β-actin was used as loading control. The Annexin V-FITC apoptosis detection kit (Santa Cruz Biotechnology, CA) was used for the detection of apoptotic cells in the three oral cell lines, as per the manufacturer’s specifications. Briefly, cells were collected by trypsinization at different time points (Control, 1, 4, 24 & 48 hrs) post-IR treatment. Cells were washed; 2μg Annexin-V FITC & 10 μl PI were added, incubated in the dark for 15 min and analyzed on a flow cytometer (FACS Caliber, BD, USA). Cells were grown on glass cover slips and Mcl-1 staining was performed at different time points in both FBM & AW8507, post-IR using an Alexa fluor-488 labeled secondary antibody (1:1000, Molecular Probes, USA), as described earlier . The AW8507 cells were treated with siRNA (100nM) and/or exposed to IR as described above. The nuclear condensation and apoptosis was analyzed by DAPI (Sigma-Aldrich, USA) staining, cell counting and imaging was done by confocal microscope with LSM Image Browser 4.2 software (Carl Zeiss). Knockdown was achieved using Mcl-1L specific siRNA (sc-43912) along with a control siRNA (sc-37007) from Santa Cruz biotechnology, USA. The siRNA duplexes were transfected using Lipofectamine-2000 (Invitrogen) according to the manufacturer’s instructions. The medium was changed after 16 hrs of transfection and 24 hrs post-transfection the cells were assessed for knockdown by western blotting. The specific silencing of Mcl-1L was confirmed in three independent experiments. Cells were seeded into 24-well plates at a density of 5 × 104 per well and treated with Mcl-1L siRNA and/or IR as described above. Cells were trypsinized and trypan blue staining was performed after 48 hrs of treatment. The number of viable cells were counted and compared to untreated control using a hemocytometer. Radioresistant sublines were generated by irradiating AW8507 & AW13516 cells with a fractionated Ionizing radiation (FIR) strategy as described earlier . During development of radioresistant cell lines, cells were collected at different doses (Control, 8, 16, 24, 32, 40 Gy) and lysates from these sublines were loaded on SDS-PAGE to determine Mcl-1L expression by western blotting. Statistical analysis was performed by using a Student’s t-test analysis. The difference between means was considered statistically significant when P < 0. 05. The data is illustrated as mean ± standard deviation of three independent experiments. 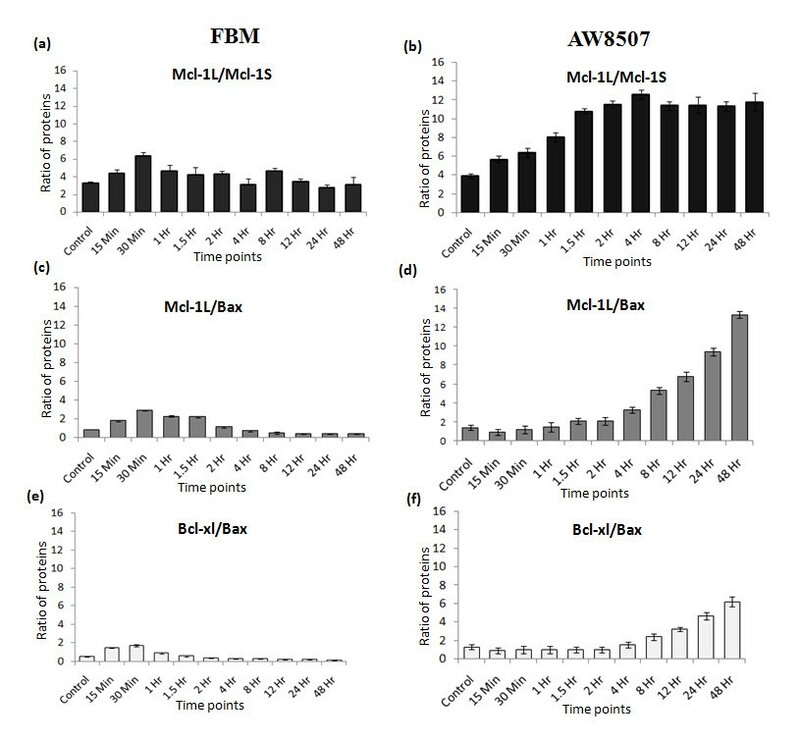 Radiosensitivity assessment of the three oral cell lines (FBM, AW13516 & AW8507) used in the study was determined by the clonogenic survival assay (Figure 1a). 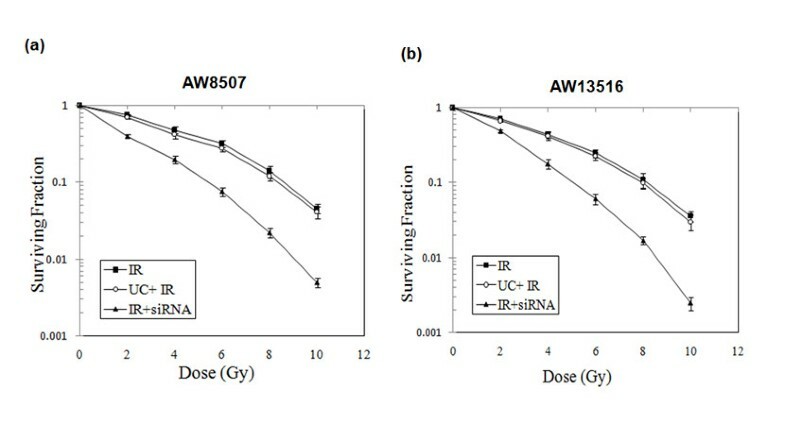 The D0 values obtained from the surviving fractions of FBM, AW13516 & AW8507 were 2.3, 5.1 & 5.4 Gy respectively, indicating FBM to be most radiosensitive among all three oral cell lines. Radiosensitivity assessment and expression of Mcl-1 isoforms in oral cell lines. (a) Clonogenic cell survival assay of FBM, AW8507 & AW13516 oral cell lines. Data given as percentage survival of untreated cell cultures and represent the means (±SD) of three independent colony formation experiments. (b) Expression of Mcl-1 isoforms in oral cell lines. RT-PCR and western blot analysis of Mcl-1 isoforms in the three oral cell lines (FBM, AW13516 & AW8507). A representative blot was shown for three independent experiments. Histogram indicates quantitative expression of Mcl-1 isoforms (Mcl-1L & Mcl-1S) at both mRNA & protein level in oral cell lines. RT-PCR using a single primer which amplifies all three isoforms of Mcl-1 showed predominant expression of anti-apoptotic Mcl-1L and low levels of Mcl-1S but undetectable levels of Mcl-1ES in all three oral cell lines. Separate RT-PCR of poorly expressed Mcl-1ES isoform showed very low levels of Mcl-1ES as compared to Mcl-1L & Mcl-1S in all the three oral cell lines (Additional file 1). 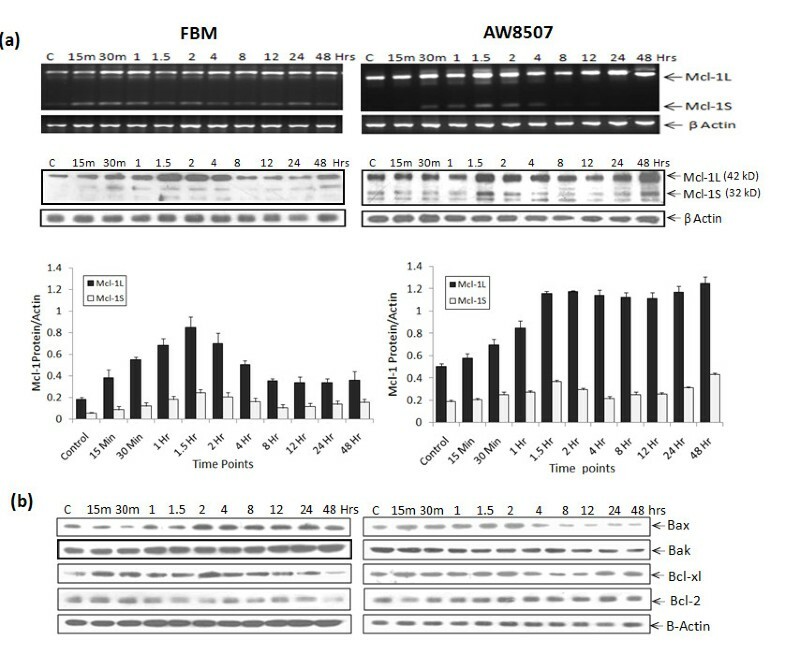 The more radioresistant AW8507 & AW13516 cells showed high expression of Mcl-1L at both mRNA & protein levels as compared to immortalized FBM cells (Figure 1b). Post-IR, the time course expression profiles of Mcl-1 isoforms in the three oral cell lines revealed induction of Mcl-1L protein in all three cell lines. However, radiosensitive FBM exhibited a rapid and short induction profile with a peak at 1.5 hrs which declined by 48 hrs. While the more radioresistant AW8507 exhibited sustained high levels of Mcl-1L up to 48 hrs with a peak observed at 1.5 hrs (Figure 2a). A similar pattern was observed in AW13516 (data not shown). In all cell lines, the expression of short Mcl-1S was elevated at initial time points which later decreased up to 48 hrs while, the short pro-apoptotic Mcl-1ES isoform levels remained unaltered (See Additional file 2). Time course profile of Mcl-1 splice variants & apoptosis related proteins post-IR. (a) Expression of Mcl-1L, Mcl-1S transcripts and proteins at different time points post-IR in FBM & AW8507. Post-IR cells were harvested at different time points, used for RT-PCR and Western blotting. (b) Western blot illustrates expression of Bax, Bak, Bcl-xl & Bcl-2 proteins at different time points post-IR in oral cell lines, using β-actin as loading control. A representative blot for three independent experiments is shown. Interestingly, AW8507 cell line exhibited a rapid downregulation of pro-apoptotic Bax & Bak proteins, 2hrs post-IR. In contrast the more radiosensitive FBM showed a consistent increase in Bax & Bak levels, 2hrs onwards (Figure 2b). Higher expression of Bcl-2 & Bcl-xl protein was observed in AW8507 as compared to FBM. The AW13516 cell line also showed similar results. It is noteworthy that, the more radioresistant AW8507 cell line exhibited higher ratios of anti to pro-apoptotic proteins like Mcl-1L/Mcl-1S, Mcl-1L/Bax & Bcl-xl/Bax as compared to that in FBM post-IR (Figure 3 a-f). A similar pattern was observed in AW13516 (data not shown). Ratios of anti to pro-apoptotic proteins; Mcl-1L/Mcl-1S (a-b), Mcl-1L/Bax (c-d) and Bcl-xl/Bax (e-f) in AW8507 & FBM cell lines. The relative ratios of expression of proteins were obtained by densitometry of blots using ImageJ software (NIH, USA). As compared to untreated control, post-IR up to 1 hr, a uniform time-dependent increase in apoptotic population was observed in all three oral cell lines. Notably, the number of apoptotic cells in AW13516 & AW8507 significantly (P < 0.05 at 24 hrs & P < 0.01 at 48 hrs) decreased thereafter as compared to that of FBM viz. from 17.5% to 9% at 24 hrs & 27% to 12% at 48 hrs of post-IR (Figure 4a), coinciding with the high Mcl-1L/Mcl-1S ratio (Figure 3b). Apoptosis induction and localization of Mcl-1 post-IR. (a) Percentage of apoptosis induction at different time points post-IR by Annexin-V & PI staining analyzed by FACS. The flow cytometry data shown is representative of three independent experiments (*P < 0.05 & **P < 0.01) (b) Immunofluorescence staining of Mcl-1 protein counterstained with DAPI (blue) shows peri-nuclear accumulation (inset) and additional nuclear localization 4 hrs post-IR in AW8507 cells. Immunofluorescence staining demonstrated that Mcl-1 protein was primarily localized in the cytosolic compartment of untreated AW8507 & FBM cells. Interestingly post-IR a substantial increase in Mcl-1 protein expression with peri-nuclear and nuclear localization at 4 hrs was observed in AW8507 cells, whereas no significant change in expression and localization was observed in FBM (Figure 4b). AW8507 cells exhibited specific downregulation of Mcl-1L levels after transfection with 100nM Mcl-1L siRNA without affecting the Mcl-1S levels (Figure 5a). The effect of Mcl-1L siRNA was maximal between 6 to 72 hrs and the Mcl-1S levels were unaltered. Treatment with siRNA and IR alone or in combination significantly increased expression of pro-apoptotic Bax protein but did not change Bak & Bcl-xl protein levels (Figure 5b). Western blot analysis of Mcl-1L knockdown. 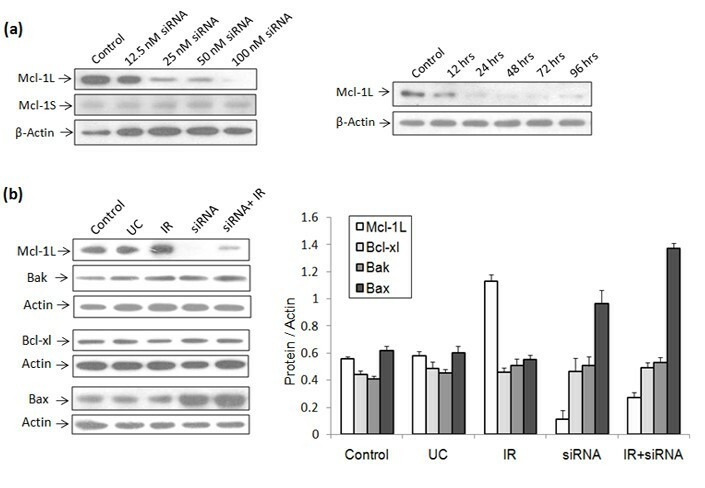 (a) Mcl-1L downregulation using different concentrations of siRNA and unaltered expression of Mcl-1S in AW8507 cells. The effect of Mcl-1L siRNA was analyzed upto 96 hrs post transfection. (b) Expression of Mcl-1L, Bak, Bax & Bcl-xl proteins 24 hrs after transfection of AW8507 cells: [Experimental control without siRNA (EC); universal control siRNA (UC); Mcl-1L siRNA (siRNA); irradiation (IR)]. A representative blot of three independently performed experiments is shown. Trypan blue dye exclusion assay in AW13516 & AW8507 revealed a significant (P < 0.05) decrease in viability of cells treated with combination of siRNA plus IR as compared to individual treatments. After 72 hrs, cell viability was reduced to 67% (IR), 42% (siRNA) and 21% (IR plus siRNA) respectively (Figure 6a&b). Thereby, suggesting a synergistic effect of the combined treatment on cell viability. Microscopic analyses of cell proliferation and apoptosis after different treatment combinations. (a & b) After different treatment combinations as described, cell growth of AW8507 & AW13516 cells were determined by counting cell numbers using Trypan blue dye exclusion assay. Cell numbers are given in percent of untreated controls. Data are means ± SD of three independent experiments. (c & d) Apoptosis was determined by DAPI staining, cells either untreated (Control) or treated with UC siRNA, Mcl-1L siRNA alone or in combination with IR. Apoptotic cells were counted in different fields and shown as percent of apoptosis relative to control. Data are means ± SD of three independent experiments. * indicates P < 0.05, ** P < 0.01. 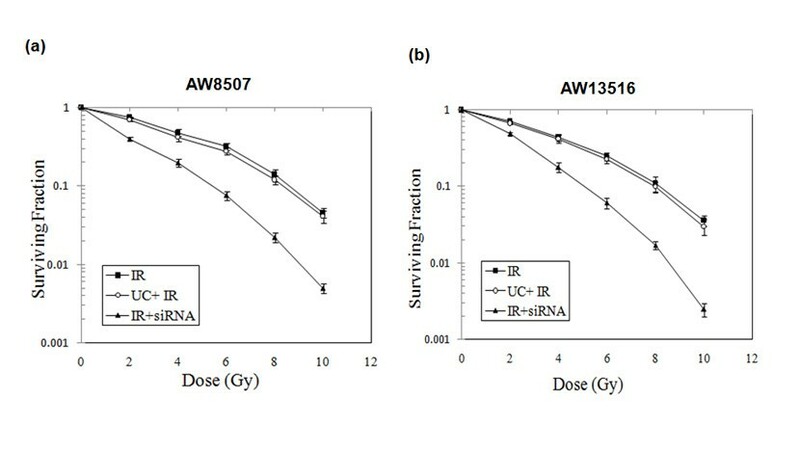 Immunofluroscence analysis of AW13516 & AW8507 demonstrated an increased nuclear condensation in cells treated with combined Mcl-1L siRNA plus IR as compared to IR or siRNA alone (Figure 6c). The percentage of apoptotic cells in experimental control (EC), UC, IR, siRNA, siRNA plus IR treated AW8507 cells were 2.1% (SD 0.5), 3.2% (SD 0.6), 17.3% (SD 0.5), 25.3% (SD 1.1) and 46.3% (SD 0.6), respectively (Figure 6d). A similar pattern was observed in AW13516. The difference in percentage of apoptosis between IR alone and siRNA plus IR treated cells was highly significant (P < 0.01) in both the cell lines. The effect of Mcl-1L downregulation on long term cell survival was examined by clonogenic assay in AW8507 & AW13516 cells. Interestingly, a reduction in clonogenic survival was observed after treatment of Mcl-1L siRNA (100nM) and increasing doses of IR as compared to the untreated control (Figure 6). The survival of AW8507 post-IR (0, 2, 4, 6 8 and 10Gy) was 78% (SD 2.1), 46% (SD 1.5), 32% (SD 2.3) and 14% (SD 1.8) and 6% (SD 1.9) respectively. However, in presence of Mcl-1 siRNA the survival was further reduced to 42% (SD 2.6), 23% (SD 1.7), 10% (SD 1.0), 4% (SD 2.1) and 2% (SD 1.7), respectively (Figure 7a). Similar reduction in clonogenic survival post Mcl-1L knockdown was observed in AW13516 cells (Figure 7b). These observations therefore suggest a synergistic effect of the Mcl-1L siRNA with IR on radiosensitivity. Clonogenic survival analysis after Mcl-1L knockdown and/or irradiation. (a & b) AW8507 & AW13516 cells were either untreated, or treated with siRNA. After 24 hrs, cell culture dishes were treated with increasing doses of ionizing irradiation (0, 2, 4, 6 8 and 10 Gy) as indicated. Survival was assessed by performing clonogenic assay as described in Methods. Data are given as percentage survival of untreated cells and represent the means (±SD) of three independent colony formation experiments. To evaluate the association of Mcl-1L with radioresistance, its expression was assessed by western blotting in acquired radioresistant sublines of AW8507 & AW13516. Figure 8 demonstrates the high Mcl-1L expression in radio-resistant sublines generated by fractionated irradiation as compared to parental untreated cells. Expression of Mcl-1L in radio resistant sublines. (a & b) AW8507 & AW13516 cells were treated with fractionated irradiation and the radio resistant sublines were assayed for expression of Mcl-1L. β-actin blot from the same lysates serve as loading control. In the present study, we demonstrate the effect of anti-apoptotic Mcl-1L expression on radiosensitivity of oral cancer cells. So far, limited information is available on the role of Mcl-1 in radiation response of tumor cells. To our knowledge, this is the first study to report a time course expression of Mcl-1 isoforms post-IR and effect of Mcl-1L knockdown on radiosentitzation of oral cancer cell lines using siRNA strategy. Our studies demonstrated an inverse correlation of Mcl-1 expression with cellular apoptosis and a synergistic effect of Mcl-1L knockdown along with IR on cell viability and clonogenic survival thereby enhancing the radiosensitivity of OSCC cells. Various growth factors and cellular stresses like radiation and cytotoxic agents are known to upregulate Mcl-1 levels, thereby enhancing short term viability . Our earlier studies had demonstrated higher expression of Mcl-1L transcript and its association with poor disease free survival in patients treated with definitive radiotherapy [10, 11]. In the present study, two tongue cancer (AW8507 & AW13516) and an immortalized oral (FBM) cell line were used due to their differing radiosensitivities and based on their D0 values, both AW8507 & AW13516 were relatively more radioresistant than FBM. Therefore, to evaluate the association of Mcl-1L with radioresistance if any, we evaluated the expression of Mcl-1 isoforms in radioresistant AW8507 & AW13516 as compared to radiosensitive FBM. 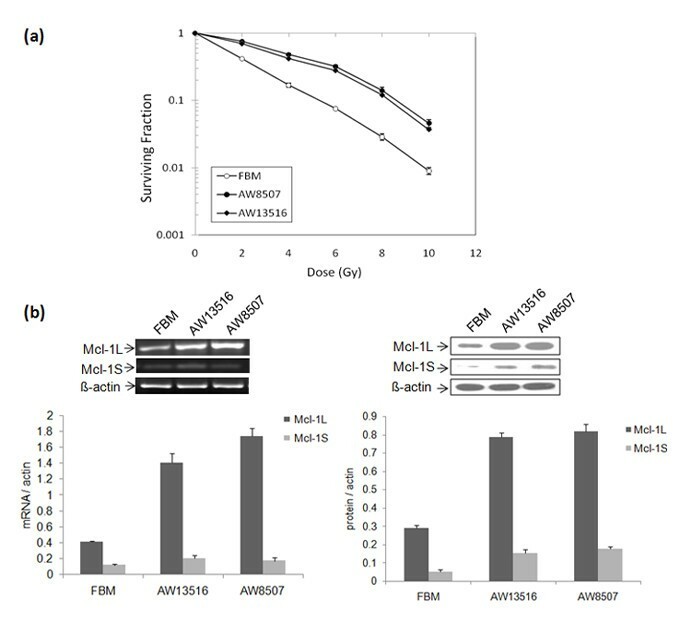 Our studies revealed higher expression of Mcl-1L at both mRNA and protein level in relatively more radioresistant AW8507 & AW13516 cell lines versus FBM, indicating a possible association of anti-apoptotic Mcl-1L splice variant with radioresistance. Several possible mechanisms can lead to the high Mcl-1 levels. Mcl-1 is known to be rapidly induced at the transcriptional level and its mRNA has a short half life . Mcl-1 is also regulated at the post-transcriptional level by micro RNAs through a mir29 binding in the 3’UTR of Mcl-1 mRNA . Interestingly, the expression of mir29 was also found to be decreased in malignant cholangiocytes, favoring the increased levels of Mcl-1, which indicates the possible reason for the observed high levels of Mcl-1 mRNA in our cancer cells lines and also responsible for its immediate degradation within few hours post IR. Mcl-1, a PEST domain containing protein is also known to undergo ubiquitin dependent degradation by the 26S proteosome and possesses a short half life of one to 3 hrs is rapidly downregulated during apoptosis . Notably, the BH3 domains of MULE/LASU1 E3 ligase specifically interact with the hydrophobic BH3 binding pocket of Mcl-1 and not with other anti-apoptotic Bcl-2 family members  and are responsible for the constitutive turnover of Mcl-1. Such ubiquitin mediated degradation of Mcl-1 has been shown to be essential for the initiation of apoptosis, following UV damage . Hence, it was interesting to study the time course expression profile of Mcl-1 isoforms and other bcl-2 family members in the above cell lines post-IR. Also, Mcl-1 protein is known to be phosphorylated by GSK-3β at Ser159, located within the PEST domain, resulting in a significant decrease in the protein half-life and leading to initiation of apoptosis . Such, alterations in the phosphorylation of Mcl-1 protein by GSK3 may also contribute to the elevation of Mcl-1 levels. Moreover, it is known that the short isoform Mcl-1S only binds to Mcl-1L possibly neutralizing its anti-apoptotic function . No significant alterations in levels of Mcl-1S & Mcl-1ESwere observed post IR, indicating that the predominantly overexpressed Mcl-1L isoform alone may contribute in generation of radioresistance. Mcl-1L not only binds to Mcl-1S, but is also known to heterodimerise with pro-apoptotic Bax & Bak etc. preventing the release of cytochrome-c and subsequent apoptosis . We observed a downregulation of pro-apoptotic Bax & Bak proteins in AW8507 post-IR, coinciding with decreased apoptosis, while in contrast, FBM showed an increase in Bax & Bak protein levels. We observed high expression of anti-apoptotic Bcl-xl which has already been shown to be associated with radiosensitization of colon cancer cells . Thus, high expression of Bcl-xl & Bcl-2, known radioresistant factors and Mcl-1L in more radioresistant AW8507 & AW13516 than FBM may indicate their possible role in radioresistance. We assessed the ratios of Mcl-1L/Mcl-1S, Mcl-1L/Bax, Bcl-xl/Bax, wherein radioresistant AW8507& AW13516 showed high ratios as compared to that in FBM indicating predominance of anti-apoptosis which may contribute to radioresistance. We are the first to elucidate the comparative levels of Mcl-1 isoforms and their association with radiation response in oral cell lines. The high and prolonged expression of Mcl-1L observed in AW8507 & AW13516 could possibly be due to Mcl-1 protein stabilization via binding with other proteins. Another reason could be its enhanced half life due to S159/T163 phosphorylation post-IR, reported to be crucial in nicotine mediated Mcl-1 activation and chemoresistance . We observed a significant reduction in apoptosis post-IR which coincided with the high levels of Mcl-1L, indicating a possible association of Mcl-1L expression with radiation response of AW8507 & AW3516 cells. The immunofluorescence staining of Mcl-1 indicated a peri-nuclear accumulation & nuclear localization post IR in more radioresistant AW8507 cell line. Such, peri-nuclear accumulation of Mcl-1 has also been observed earlier in polymorphonuclear leukocytes post-etoposide treatment . In AW8507, the observed nuclear and perinuclear accumulation of Mcl-1 may possibly help in cell survival to lower doses of DNA damaging agents. A similar regulatory role for Mcl-1 (snMcl-1), perhaps acting as an adaptor protein in controlling the ATR-mediated regulation of DNA damage checkpoint kinase Chk1 phosphorylation and activation has been reported, placing Mcl-1 at the interface of apoptosis and cell cycle regulation . Mcl-1 has been shown to regulate cell cycle by binding to proteins like CDK1 & PCNA , possibly explaining the observed nuclear localization of Mcl-1. High expression of anti-apoptotic Mcl-1L and Bcl-xl proteins and reduced pro-apoptotic proteins like Bak & Bax together may possibly contribute in lowering the sensitivity of AW8507 & AW3516 cells to IR. The downregulation of Mcl-1L alone was efficient in induction of apoptosis in both AW8507 & AW13516 cells. Interestingly, the combination of Mcl-1L siRNA plus IR induced significantly higher apoptosis as compared to siRNA or IR-alone in both oral cell lines. Notably, the expression of closely related Bcl-xl, a known radioresistant factor was not altered. However, the expression of pro-apoptotic Bax protein correlated with the increased apoptosis on Mcl-1L knockdown. This overexpression of Bax, a downstream pro-apoptotic member, may execute the intrinsic apoptotic pathway resulting in increased cell death. To address the fact that the induction of apoptosis may not necessarily lead to long-term response to radiotherapy, we performed the clonogenic assay which demonstrated that combination of IR and Mcl-1L downregulation synergistically reduced clonogenic survival as compared to each treatment alone. Our studies demonstrate that Mcl-1L downregulation potentially enhanced radiosensitivity of AW8507 & AW13516 cells in vitro. Complex interactions occur between Bcl-2 family proteins especially, Bak & Bax, where Mcl-1 plays a crucial role in engaging and maintaining pro-apoptotic Bak in an inactive state and accumulates H2AX and ATM proteins to activate DNA repair pathways, suggesting that elimination of cellular Mcl-1 is crucial to initiate apoptotic pathway . Overexpression and nuclear accumulation of Mcl-1 in AW8507 may occur due to a protein called IEX-1 which has been shown to interact specifically and timely with Mcl-1 controlling its accumulation and nuclear translocation in response to DNA damage and contribute in the activation of DNA repair pathway by Chk1 activation and G2 checkpoint arrest . The high expression of Mcl-1L, in radioresistant sublines developed by fractionated ionizing radiation provides a direct evidence for the role of Mcl-1L in radioresistance of OSCC cells. Therefore, the combination of radiotherapy and Mcl-1L downregulation has the potential to improve the response rate of treatment-resistant oral cancer cells. Selective inhibitors like Obatoclax, which specifically overcome Mcl-1 mediated resistance, is already in phase 2 clinical trials  and may have important therapeutic implications, when used in combination with radiotherapy in treatment of oral cancer patients. Our studies indicate the association of Mcl-1L isoform expression with radioresistance by influencing apoptosis, proliferation and clonogenic survival of OSCC. Thus, Mcl-1L appears to be a promising molecular target for improving outcome of radiotherapy in oral cancer patients. Sodium dodecyle sulfate polyacrylamide gel electrophoresis. VP aided in study design, performed experimental procedures, analyzed the data and drafted manuscript. TT designed the study and reviewed the manuscript. All authors read and approved the final manuscript.